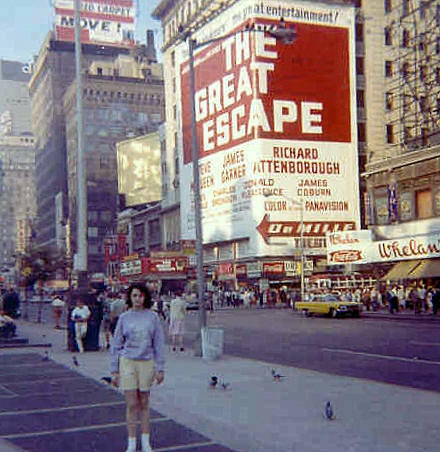 The Great Escape project involved John Sturges' Alpha Corporation, The Mirisch Company and United Artists, with a four million dollar budget, it opened in the United States on the fourth of July, 1963 to great reviews. 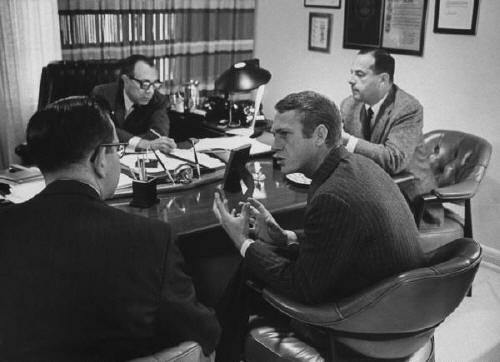 Actor Steve McQueen, star of 'The Great Escape', discussing picture with film's producers, the Mirisch Brothers. Operating out of the Samuel Goldwyn Studio and underwritten by United Artists, the prime objective of The Mirisch Company was to attract the best directors in town by promising them more control over the tools of production and an opportunity to share financially in the fruits of their labours. Where were the actors and the crew based in Munich during the filming at the Bavaria Studios and the surrounding area? Where were the actors and crew based in Fussen during the filming of TGE? I will also include an article in Australia Road Rider. 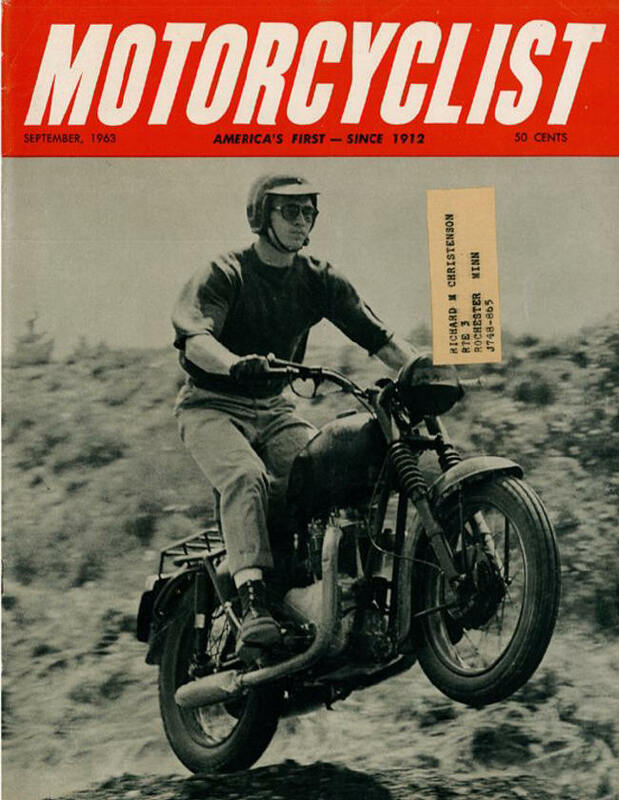 In retirement, Sturges insisted that there never was much of a script for what would become his greatest triumph. 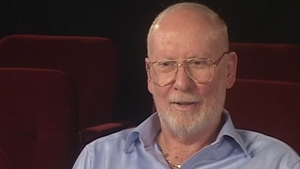 Assistant director, UPM, producer and studio executive Robert Relyea discusses his work on some of the most significant films he worked on including West Side Story, Bullitt and The Magnificent Seven. Relyea explains the importance of safety on the set, why the second AD needs to know as much as the producer, and what not to say to the head of a studio. Robert Relyea arrived in Munich in late April 1962 with the intention of commencing the picture on the 4th June at the Bavaria Studios with the completion date towards the end of August 1962. Don -- Thank you for your note. I'm so impressed with the website and your passion for The Great Escape. 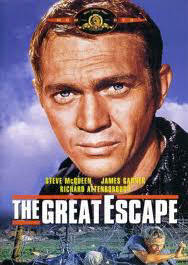 Of all the films my father was involved with over his career, The Great Escape is my favourite. 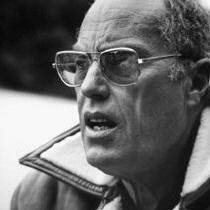 Along with Bullitt, that film has his imprint on it more than any of the other films he was a part of. I spent a month with my father on location in and around Munich during the filming, I was 8 years old at the time so I don't remember a lot. I'm sure it would be a fascinating experience to go back for the 50th celebration (my birthday is August 6th), but I don't believe my work schedule will allow it. I'll be with you in spirit, as I know my father will be as well. I wanted to let you know that my book is coming out in Canada in the fall, it will be called This Great Escape: The Case of Michael Paryla. Michael Paryla was an actor like his mother and father. 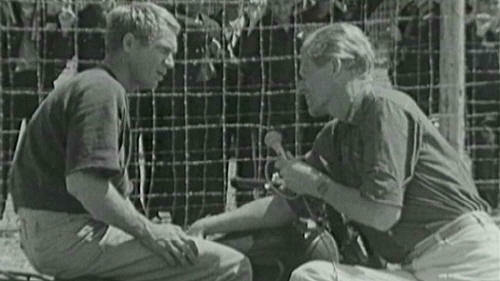 Before his death in Hamburg, in 1967, he had a small part in John Sturge's The Great Escape. 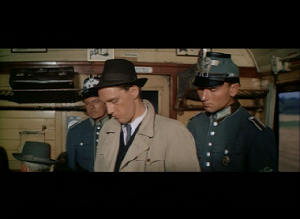 Actually, he played a Gestapo agent; and here he is on a train in the movie about to have words with Richard Attenborough and David McCallum. I have spent the last five years finding out about him. Saturday, July 31st 2010 Drove to Dover. Caught the 11.15pm boat to Calais. Sunday, August 1st Arrived at Calais at 2.00am - french time. Drove 800 miles to Deining (north of Munich).....wrong Deining !! Sunday, August 1st Booked into the Leonardo Hotel, Munich at 2.00pm......shattered ! 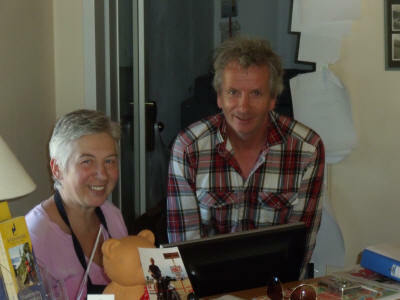 Monday, August 2nd Arrived at Bavaria Film Studio at 11.00am for the English tour at 2.00pm. Don Whistance, performing a small scene after a tour around Bavaria Studios, Munich. Drove on to Fussen. One double room found at 9.30pm. Slept on the floor. Tuesday, August 3rd Booked an apartment room for two nights at the Guglhupf Hotel, Fussener Str. Drove to the Pfronten area. Met the hairdresser Jackie (owner of the Frifeu salon in WeiBbach) who was 14 years old when the filming took place at the bottom of his road.Took time out and had a ride up a mountain in an Alpine lift, Pfronten. Wednesday, August 4th Owner of the Guglhupf Hotel( www.hotelguglhupf.de ) / ( info@hotelguglhupf.de ) introduced Mac (real name Gunther Hundertmark) a retired DJ to us. Mac showed us The Great Escape locations in Fussen. Met Jackie who confirmed The Great Escape locations in the Pfronten area. Had a beer with him and his wife. Thursday, August 5th Left Fussen and headed back to Calais travelling through Germany, Austria, Switzerland, France, Luxumberg and Belgium. Broke up the journey in Luxemburg with a meal in the heart of the town centre......a pizza at The Pizza Hut ! Arrived at Calais a day early 1.00am and caught the 1.30am boat back to Dover. Friday, August 6th 2010 Arrived at Dover at 2.30am(British time) and arrived in Weymouth at 7.00am...shattered ! Returned to The Great Escape locations on Monday, 8th August 2011 using an easyjet flight and returned to Gatwick Airport on Thursday, 11th August 2011 with lots of thoughts and information. The Great Escape Film was 50 years old on the fourth of July, 2013.... it has been decided to organise another 'tour' for all those fans interested in joining the celebration of the release of this iconic film. Kevin Hay from BBC News here. 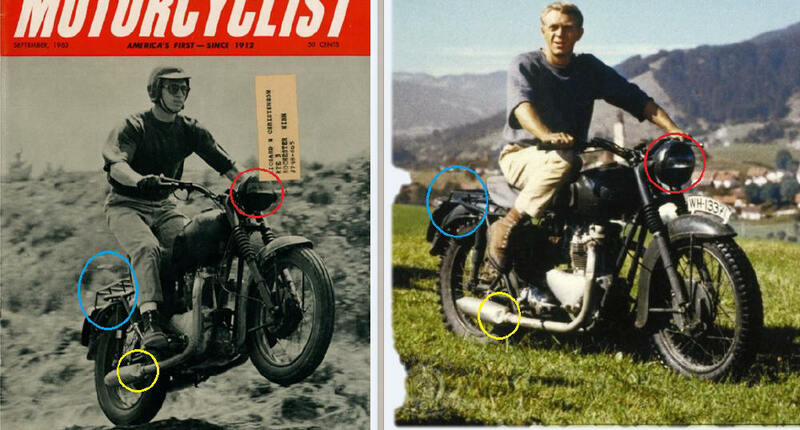 We have spoken before about your work on finding the Great Escape filming locations. I have had some positive noises from my editor about commissioning a feature story about this but I have run into a problem with the timings. Because the anniversary of the film is July 4th we would need to film something ahead of this date. Do you think you would be able to go over to Bavaria with our reporter at some point between now and the beginning of July? If we can agree a date the BBC should be able to pick up flights and hotel bill’s for a short trip. How does that sound? 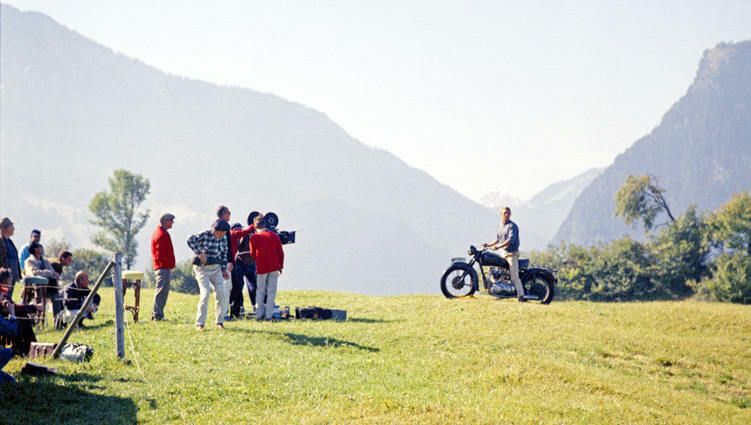 I am writing to ask your advice on a trip I am planning to visit all the Great Escape Movie locations in Fussen etc. & would be grateful for any advice you can give me & indeed any tours that you might be able to fix us up with. I am planning this trip with my wife & need to know when the exhibition ends at the Town Hall . I am travelling from the UK & would love to be able to stay at what used to be the Pergola hotel I think now is the Alpina! I would be most grateful for any advice you can give me with my travel plans. I just found your website. I think I´m one of the biggest fans of TGE. I would like to see more of all the fantastic information and photos you have as you wrote!!! Where do the stars based during filming? Do you know that???? I would like to know too! What do you know about the filming in Fuessen, in Hopfen and all the other places? I would like to come to your tour! Please answer as soon as possible. Is it possible to give you a "like" to your website? I would like to do that, ´cause your site is so amazing! it was harder as i imagined. This time i found your well done site. It helped me to match all the places. Now i have photos of all locations in ever angles and sights. If you need some pictures please let me know.With pleasure i had been with you on your 2013-Tour,but sadly i have to work. But i try to be on tour with you and the other tge- fans 2014. I want visit and view the whole content of your site, because its great fun and inspiration for me to see the updates, pictures an news that come from all over the world. Mr.Whistance, what have i to do, that i can see the whole content of the site ? P.S. : The crossroad is a minor way from outside pfronten weissbach (there is a parking lot and a woddencross) to the roundabout on the left side. If you are interested, i send you some pictures. 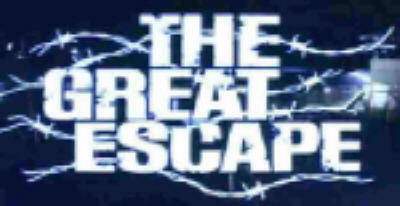 I will schedule a trip on « the great Escape » locations, and you site is the best on I think to do that. Unfortunately some links are broken and I can’t find the right place and town where I have to go to be exactly on the right place. I would love attending the tour in August but there is no possibility of that happening. Nor do I have any pictures of the scene. Sorry. Love your web page! I really enjoy going through it and finding so much interesting information. It was always one of my favourite movies. I really got into history of the movie after recently buying a long sought remake of Steve's A-2 movie jacket from Eastman Leather.I am from Switzerland currently residing in Singapore and will spend my annual leave in Switzerland this August. Can you please keep me in the loop on the plans on the 2017 Great Escape Tour. I would be interested in joining. I'm really enjoying your site, the photos, the stories, your travels. 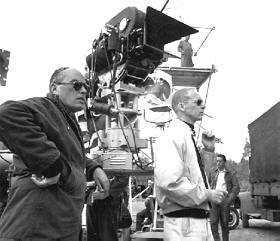 I wanted to know if you have heard any stories or read anything about the Director, John Sturges giving any cigarette lighters to cast or crew of The Great Escape as gifts? I believe I have one, that I just got, and was hoping to get some first hand account of it or them being given out. If you don't know, perhaps you can lead me to someone who might? It's getting harder to find anyone alive who worked on the film. I am a French Zippo lighters collector, living in Versailles near Paris. Me and a German Zippo collector, both owned a Zippo lighter with same engraving on double sides related to "The Great Escape" movie. Please find in attachment, a PDF file (don't worry it is not a virus) with 4 photos about this lighter. On one side, it is engraved "The Great Escape - Munich 1962", and other side: "Thank you John Sturgis". The lighter itself is dated from 1961: 3 dots and 2 dots on bottom. We are desperately trying to find more information about this Zippo lighter. By any chance, do you have some informations about this lighter? We also would like to get in touch with the person named "Josh" who wrote the following message on your web page "The Great Escape Locations Site". May be Josh has some informations and also owned the same lighter. We would appreciate very much, if you could send us his personal email address. Last week I was invited to visit various locations used in Germany when making the Great Escape and on Tuesday May 27th 2014 I flew from Stansted to Munich. Driven to a guest house called Alpina in Hopfen-am See. In 1962 this guest house was called the Pergola and was owned by the present owners father. It was where I stayed in September 1962 along with John Sturges, Steve McQueen, James Garner, Richard Attenborough, James Coburn, Gordon Jackson, and Charles Bronson for location scenes shot outside the camp. The owner still has a copy of the original guest list. Wednesday 28th May I was driven to the nearby town of Fussen and revisited the various locations used when shooting the Great Escape. These included the café scene with James Coburn, the station platform scene where Richard Attenborough and Gordon Jackson get off the train, the place where Richard Attenborough was arrested, where Steve McQueen filmed the bike scenes and the actual spot where Charles Bronson and I found and got on the rowing boat and the part of the river we rowed down. All very nostalgic. Fussen is a very pretty Bavarian town. I was shown around the beautiful museum as a special guest of the curator. The Museum is in a very oldMonastery and had a special section dedicated to the making of the Great Escape where they built a replica tunnel, camp watch tower plus lots of photos. Fussen is very proud of the fact it was used for so many location scenes when we were making the great Escape and refer to it in various tourist brochures as 'Hollywood in Fussen'. Wednesday evening I stayed at the Hotel Christine in Fussen where there are lots of signed photos of me from the film on the wall of the restaurant. earlier that day I also discovered a recent photo of me next to a photo of Steve McQueen in the very smart hairdressing salon. The photo of me is sitting in a chair in the salon having my hair cut. I returned back to Stansted Thursday 29th May 2014. I'm running some photos of the Fussen locations and Great Escape exhibition by a reader in next issue. If you would like to send me a short press release about your site, I will include it in the article. Love movies from the 60s and 70s? Then subscribe to the magazine devoted to this brilliant era in cinema history. 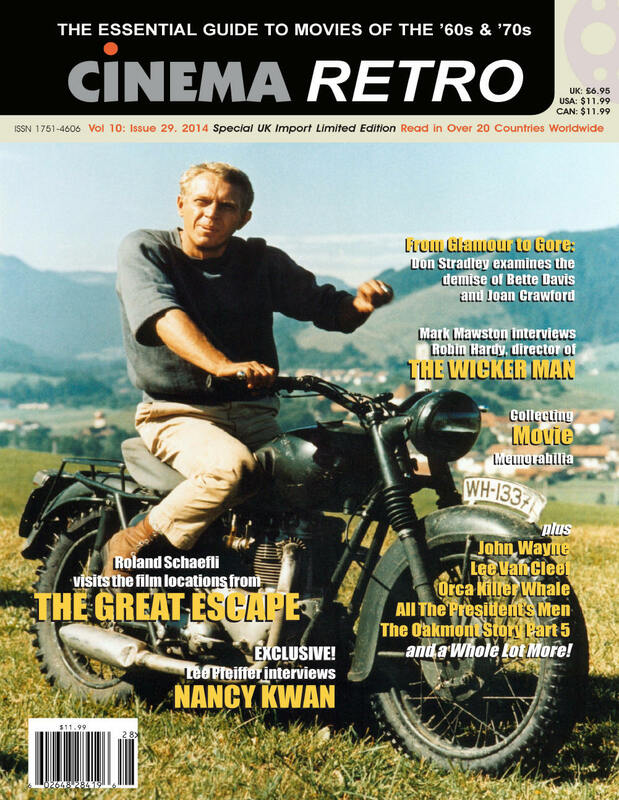 With contributions from Christopher Lee, James Caan, William Shatner, Michael Winner and a whole host more, check out www.cinemaretro.com and subscribe to the best film magazine in the world. Of course. I will send you several. Cover attached. Can you put on your web site? I may be in Weymouth on April 25th, so maybe I could drop the magazines off and meet you. I’m working for a new company, keep me posted of the next one you are planning ok, hope you are well. Swiss weekly magazine: "Ostschweiz am Sonntag"
There you can read that the Go-Kart track of Garching Hochbrück is the only outdoor track in and around Munich since 1960... so it should be this one. 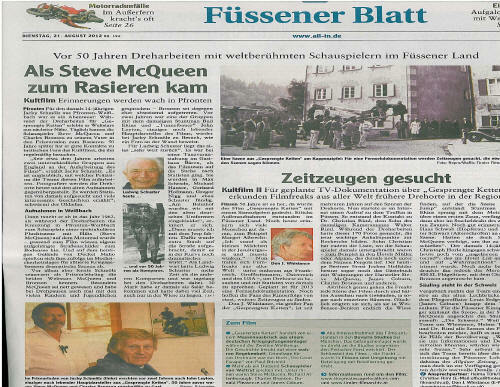 Fussen Newspaper Article about the 12th August 2014 meeting about saving the Fussen Railway Station..
Click on the website below to watch the video about "The Saving Of Fussen Railway Station From Demolition..."
Hi, I am currently on holiday in Wertach, I found your web site interesting about the Great Escape, I have visited Fussen including the railway Stn. Are you able to confirm location of the crossroads or where the jump took place. Same hillside.........50 years later !! Please click here email if you wish to leave a message or to add any information to this website. 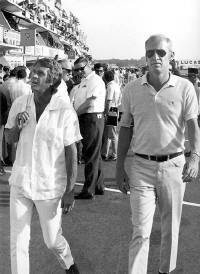 I am a french great fan of steve mac queen and the great escape , i m interested to join you for the 2015 tour . it is possible ? Thank you very much for sending me the notice of Tom's passing. It goes right along with the recent passing of Angus and Dicki and Jimmy. There are not too many of us left. Let me take a moment to congratulate you on a very thought provoking web site. 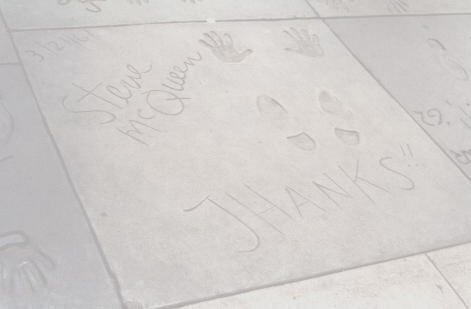 You keep alive the memory of some of the industry's finest performers. From the bottom of my heart, I thank you. May you and your family and friends share in our best wishes for a Merry Christmas and a prosperous and bright New Year.